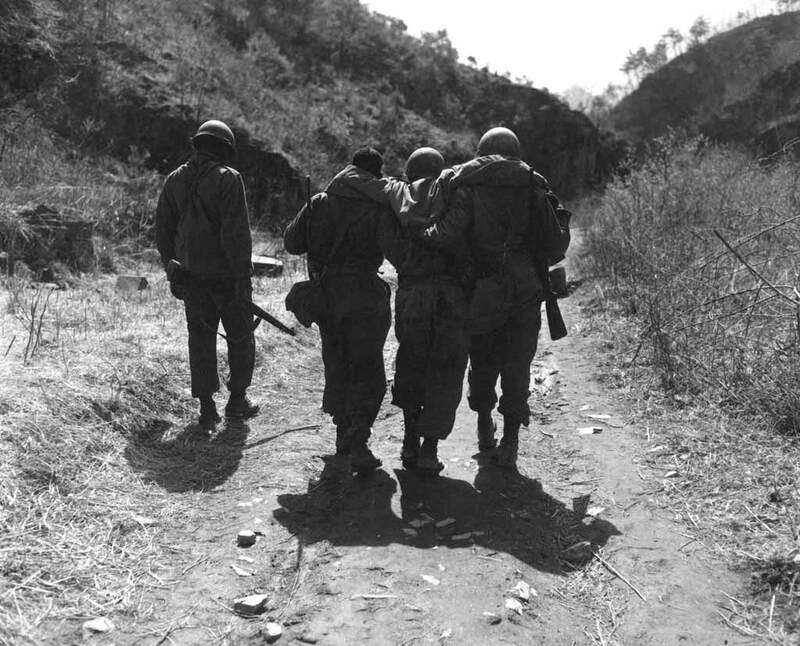 Though the Korean War came to be regarded as a failure by many because of its unsettled conclusion, in one area it was an unreserved success: the care and treatment of wounded soldiers. In World War II, the fatality rate for seriously wounded soldiers was 4.5 percent. In the Korean War, that number was cut almost in half, to 2.5 percent. That success is attributed to the combination of the Mobile Army Surgical Hospital, or MASH unit, and the aeromedical evacuation system – the casualty evacuation (casevac) and medical evacuation (medevac) helicopter. 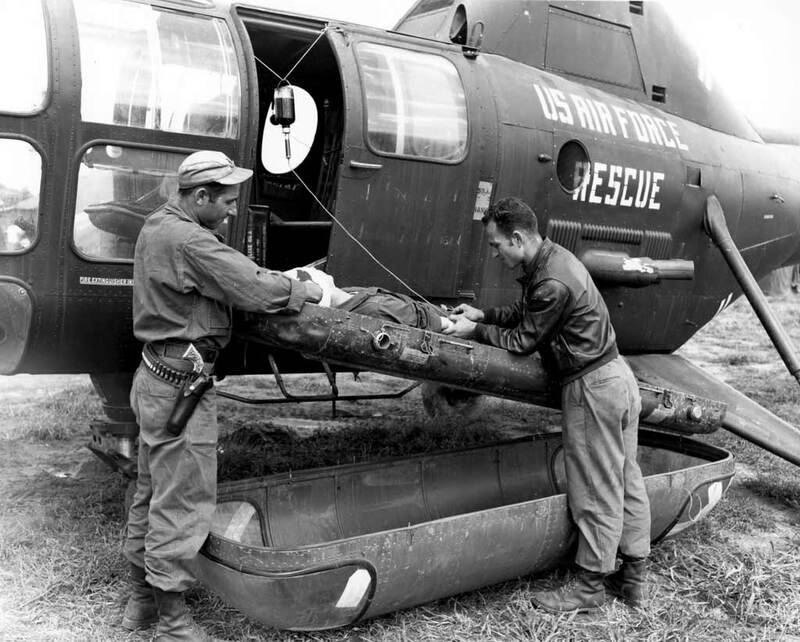 Both had been developed and used to a limited extent prior to 1950, but it was in the Korean War that both – particularly the helicopter – came into their own, and as Army Maj. William G. Howard wrote, “fundamentally changed the Army’s medical-evacuation doctrine.” Helicopter medevacs transported more than 20,000 casualties during the war. One pilot, 1st Lt. Joseph L. Bowler, set a record of 824 medical evacuations over a 10-month period. Another example tellingly highlights the impact of the helicopter. The Eighth Army surgeon estimated that of the 750 critically wounded soldiers evacuated on Feb. 20, 1951, half would have died if only ground transportation had been used. The Korean War also provided an opportunity to study and test new equipment and procedures, many of which would go on to become standards of care in both the military and civilian medical communities. These included vascular reconstruction, the use of artificial kidneys, development of lightweight body armor, and research on the effects of extreme cold on the body, which led to development of better cold weather clothing and improved cold weather medical advice and treatment. The newest antibiotics were used widely, and other drugs that advanced medical care included the anticoagulant heparin, the sedative Nembutal, and the use of serum albumin and whole blood to treat shock cases. In addition, computerized data collection (in the form of computer punch cards) of the type of battle and non-battle casualties was used for the first time. The extensive detail and accessibility of this data allowed for the most thorough and comprehensive analysis of military medical information yet. Like the other organizations within the military, when the war started in June 1950, the medical departments were short of everything. The most acute shortage was with doctors, particularly specialists. A doctor draft was instituted in August 1950, and the first medical draftees arrived in Korea in January 1951. By the following year, 90 percent of the doctors stationed in Korea were draftees. Combat medical care doctrine in Korea consisted of a relay system. The first line of care was organized around two groups: a battalion aid station and a separate forward collecting station. The latter contained eight men composed of a doctor, medics, and litter bearers. Wounded would be gathered at them and an initial diagnosis, triage, and tagging would be performed. Harold Selly was an Army medic, part of a forward collecting station team. “We were always in danger of being attacked by the enemy, overrun by the enemy, being shelled by artillery, shelled by mortar, and grenades thrown into the station,” he recalled. The wounded would then be transported to a larger collection station located behind the front line. 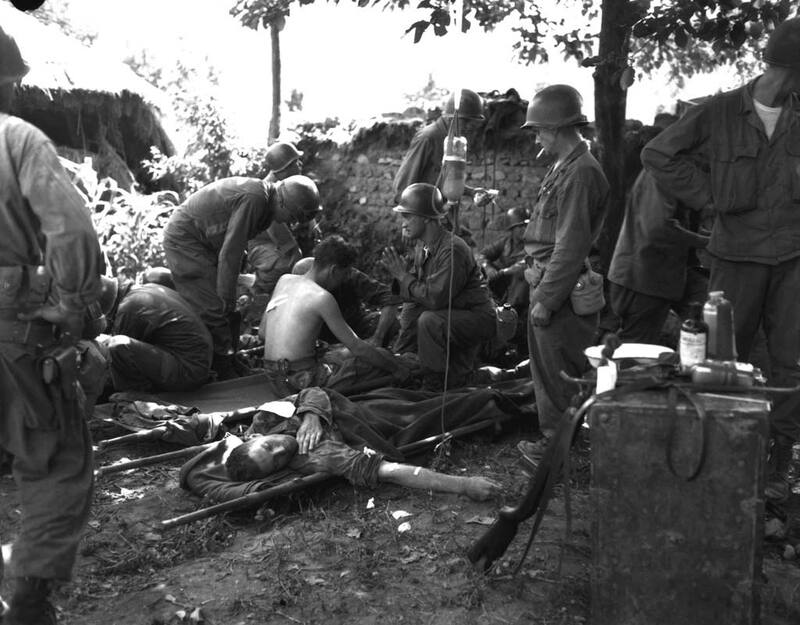 Once the wounded had been stabilized, they would be transported to a MASH unit or a division clearing station, depending on the type of wounds. From there the wounded would be transported to an evacuation hospital. If the wounds were serious enough, the wounded would then be airlifted to a hospital in Japan. Prior to the war, leaders in all the branches believed that the best way to transport wounded was by ground-based vehicle or ship. Rotary-wing evacuation was considered a means of last resort. The primitive to nonexistent road network in Korea forced commanders on the peninsula to reassess that doctrine and seek a faster alternative solution. Rotary-wing evacuation was considered a means of last resort. The primitive to nonexistent road network in Korea forced commanders on the peninsula to reassess that doctrine and seek a faster alternative solution. In July 1950, the Air Force deployed the 3rd Air-Sea Rescue (ASR) Squadron under Capt. Oscar N. Tibbetts. It was a unit trained to rescue downed aircrews behind enemy lines or in the sea. In August 1950, however, 3rd ASR Squadron received an Army request that changed the role of the helicopter in Korea and marked the beginning of a doctrine change in casualty evacuation. A forward aid station located on the summit of a 3,000-foot mountain had a seriously wounded soldier, but couldn’t do a ground-based evacuation because the enemy had cut off its route to the rear. The request was to fly the wounded soldier out by helicopter. The mission was a success, and the soldier’s life was saved. Capt. Leonard A. Crosby of the Army Medical Service Corps immediately recognized the helicopter’s potential impact. In order to expedite its implementation as an aerial ambulance, on Aug. 3, 1950, he arranged for a demonstration in the courtyard of Taegu Teacher’s College. The demonstration was so successful that one week later the commander of the Fifth Air Force authorized the use of its helicopters in frontline evacuation of Army wounded. U.S. Army Surgeon General Maj. Gen. Raymond W. Bliss heard of Crosby’s demonstration and, after a fact-finding tour of Korea and a meeting with theater commander Gen. Douglas MacArthur, returned to the Pentagon with MacArthur’s recommendation “that helicopters should be in the Tables of Organization and Equipment and should be part of medical equipment – just as an ambulance is.” By the end of October 1950, eight helicopters assigned to frontline evacuation of wounded were on their way to MacArthur’s Far East Command. In 1951, the Army and the Air Force agreed that Army helicopters would be responsible for frontline rotary-wing aeromedical evacuation, and the Air Force would provide fixed-wing aeromedical evacuation outside the combat zone.